The early scenes of PHASE 7 recall SHAUN OF THE DEAD in the way that Coco (Daniel Hendler) and his pregnant wife Pipi (Jasmine Stuart) are oblivious to the signs all around them that something is dreadfully wrong. They return home to their apartment building after doing a little grocery shopping to find out that a new virus has been spreading rapidly, and quarantines are being instituted in some places. As it turns out, Coco and Pipi's apartment is one such place. The couple don't seem too distressed, though, trusting that the government will handle everything just fine and this will all be over soon. Of course as anyone who watches movies like this (or simply watches the news once in a while) knows, that ain't likely. Fortunately for the clueless Coco, his neighbor Horacio (Yayo Guridi) takes him under his wing. Horacio believes the plague is all part of a “New World Order” plan for population control and has been planning for just such an event and gives Coco one of his extra bio-hazard suits and a gun. Coco is still reluctant to believe things are bad enough to warrant such a response, but as the quarantine wears on and some of the other neighbors descend into violent thuggery, he starts to realize his good fortune in having Horacio on his side. The question is, why does Horacio care about Coco? 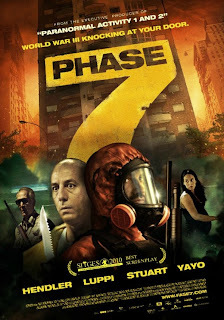 PHASE 7 plays as a taut horror/thriller with a hint of black humor and satire just beneath the surface. The performances are solid and director Nicolás Goldbart does a fine job of slowly building the tension. Aside from SHAUN OF THE DEAD, there are some minor similarities to [REC] and its American remake QUARANTINE, and just about any film of this sort in which a sudden catastrophe leads to destruction more through the humanity's inability to work together than the threat itself can't help but recall the films of George Romero. More than anything, though, this feels like a knock-off of CONTAGION geared more towards an exploitation movie audience. One can imagine Lucio Fulci, if he were still alive, cranking something like this out. Even the soundtrack has that late seventies/early eighties exploitation movie feel, sounding like a cross between John Carpenter and Richard Band (the guy who scored all those Empire and Full Moon productions). But PHASE 7 was actually made before CONTAGION, and as much as I love Fulci, he wouldn't have made a film nearly this good. It probably would have had a lot more gore in it, though. 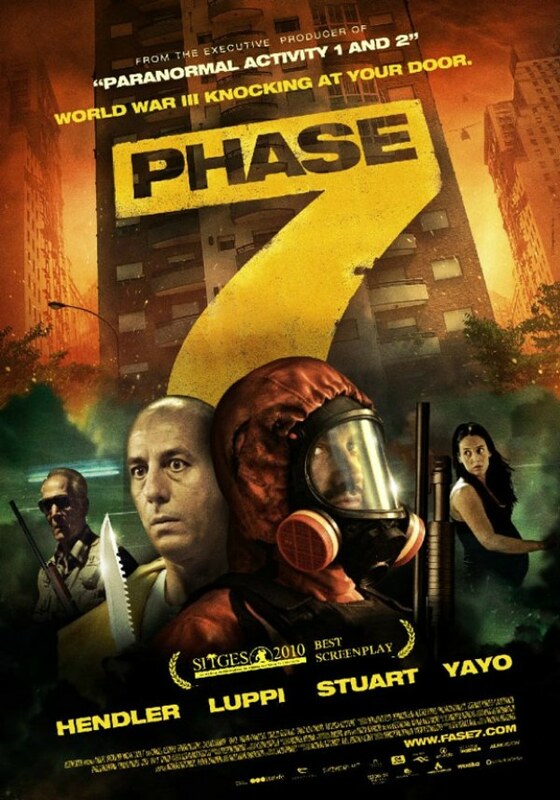 Whatever its inspirations, PHASE 7 is original enough to stand on its own merits. Despite the pessimistic scenario it deals with, its also a good bit of fun. The DVD and Vudu's on demand service offer the film in both its original Spanish with subtitles and and English dub. I watched it on Netflix Instant, where it was only available in Spanish. Normally that's the way I'd prefer it, but the old school eighties exploitation vibe was so strong in this film that I kinda wished I could have seen the dubbed version. 3 out of 4 stars.